SoCo Sports (aka Sarasota Sport & Social) was created in March 2009 by a couple transplanted from Chicago to improve the quality of life in Sarasota and Manatee County. They offer adult sport & social leagues to get people out and active. 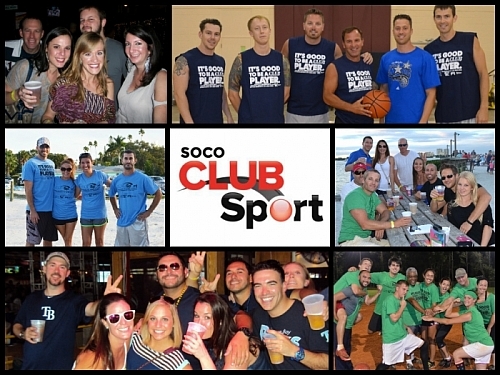 SoCo Sports was acquired by Tampa Bay Club Sport in late 2012 making it the largest sport & social club Florida serving over 30,000 adults annually. The Sarasota branch of the club has been rebranded as SoCo Club Sport. SoCo Club Sport provides a fun and healthy environment for adults (18+) to energize, exercise, socialize while developing long lasting friendships and relationships. It is a great way to meet new people and stay active in a fun, relaxed environment. We create this environment by organizing and facilitating various coed recreational sports leagues, tournaments,and social events. Simply put, we facilitate fun! SoCo Club Sport offers adult sports in Softball, Kickball, Futsal, Volleyball, Soccer (indoor & outdoor), Flag Football, Basketball and more! With locations throughout the Suncoast in Manatee & Sarasota counties we have a location close to you!